Is all this talk of candy making you drool? The Texas Hill Country is home to many wonderful sights, including boxes of specialty chocolates and other goodies made by Austin's Lammes Candies. William Wirt Lamme opened the Red Front Candy Shop on Congress Avenue in 1878 , but in 1885 , he lost the company in a poker game. His son, David Turner Lamme, paid the gambling debt and reacquired the store, naming it Lammes Candies. Lammes (pronounced "lambs," which explains the company logo) has been family owned and operated ever since. David Lamme, Sr. developed the Texas Chewie Pecan Praline in 1892 . The buttery caramel and pecan confection (using only Texas grown pecans) is Lammes' most popular candy, that is, if you don't count the decadent, but only seasonally available, chocolate-dipped strawberries and grapes. Devotees monitor Austin radio stations and the local newspaper to find out when these special treats will go on sale. Lammes makes a wide array of candies, including old-fashioned treats like toffee, divinity, cherry cordials, and peppermint kisses which they sell at their stores in Austin, San Marcos and Round Rock, or you can order from Lammes Candies website. If you're counting calories or can't eat sugar, you can order sugar-free chocolates. Is all this talk of candy making you drool? Here are three recipes that may not be quite as delicious as those Lammes Candies uses, but they come pretty darn close. Austinites arrange their schedules around the availability of these special treats. In a medium saucepan, bring 2 inches of water to a bare simmer. Place the chocolate in a stainless-steel bowl big enough to rest on top of the saucepan and set it over the pan, making sure it doesn't touch the water. Heat, whisking occasionally, until most of the chocolate is melted. Remove from the heat and whisk until smooth. Hold a berry by its stem and dip three-fourths of it into the melted chocolate letting the excess drip back into the bowl. Then place the dipped berry on the prepared baking sheet. Repeat with the remaining strawberries, working quickly. Place the baking sheet immediately into the refrigerator and chill until the chocolate is firm, about 1 hour or up to 8 hours. Note: Your refrigerator is integral to the success of this recipe. The berries must be well-chilled when dipped into the chocolate, so that the chocolate will set up quickly without streaking. The dipped berries must then be immediately refrigerated until serving. Instead of washing them in water, wipe the strawberries clean with paper towels. The smallest droplet of water on the berries will cause the chocolate to seize up. Chocolate-dipped strawberries should be served the same day they're dipped. If you keep them longer, the fruit may begin to deteriorate. 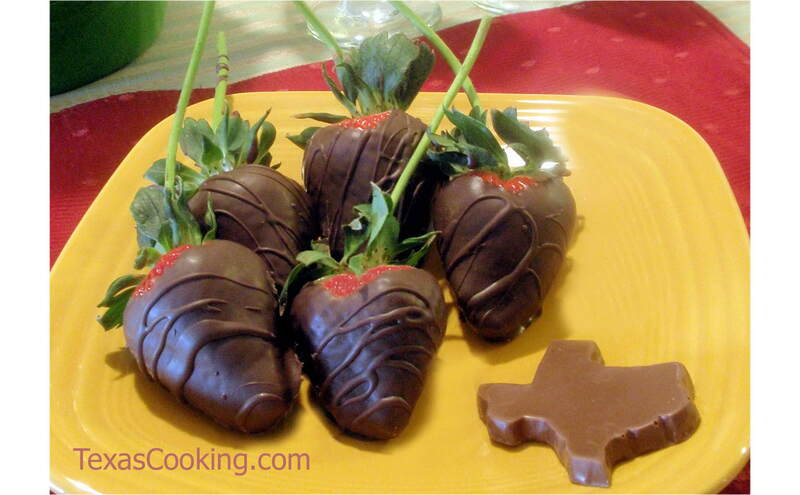 Makes 16 to 20 dipped strawberries..
Lammes makes a similar candy called a Longhorn. Is it possible that the name was chosen to honor Austin's favorite football team, the University of Texas Longhorns? Place the caramels and cream in a heavy small saucepan over low heat. Stir constantly until the caramel is melted. Remove pan from heat and set aside. Arrange 5 pecan halves in a grouping on the cookie sheet to resemble a turtle's legs and head. Repeat with remaining pecan halves until you have made 24 groupings. Using the back of a spoon, spread 1 to 2 tablespoons of caramel over the center of each grouping of pecans. The caramel will become the turtle's shell, so make sure you leave the ends of the pecans (the head and feet) exposed. Let caramel firm up while you melt the chocolate. Melt half of the semisweet chocolate in the top of a double boiler set over hot water. (If you don't have a double boiler, place the chocolate in a bowl that fits snugly over a pot of hot water.) When the chocolate has melted completely, remove the top part of the double boiler (or the bowl) from the hot water. Add the remaining 4 ounces of semisweet chocolate and stir until all of the chocolate is melted and smooth. Insert a candy thermometer or chocolate thermometer into the melted chocolate. The temperature should read 88 to 90°F. If the chocolate is too cold, place it back over the hot water until the temperature reaches 88 to 90°F. If it is too hot, let it cool until the desired temperature is reached. Using the back of a spoon, spread 1 to 2 tablespoons of the chocolate over the caramel to cover it completely. Remember to leave the tips of the pecans exposed. If desired, use a toothpick to draw lines in the chocolate to represent the turtle’s shell. When completely set, (about 4 hours at room temperature), peel the turtles off the waxed paper. Store the turtles in layers, separated by waxed paper, in an airtight container at room temperature for up to 1 month. This variation on Lammes almond toffee is sans almonds with chocolate coating. Butter a jelly-roll pan or an 11 x 17-inch baking pan. Set aside. Melt the butter in a large heavy saucepan over medium heat. Don't allow the butter to brown. Add the sugar, water, and corn syrup to the melted butter. Stir until the sugar is completely dissolved. Bring the mixture to a boil without stirring. Clip a candy thermometer to the inside of the pan. Continue to cook, without stirring, until the mixture reaches 300°F (hard crack stage). Remove the pan from the heat and immediately pour the hot syrup into the prepared pan. The syrup will spread thin but may not reach the corners of the pan. Don't spread it any farther. While the toffee is still hot, spread the chocolate chips on top of the candy. As the chips melt, use a 1-inch pastry brush to spread them over the top. Allow the candy to cool completely in the pan. Slip the end of a flexible spatula under the edge of the toffee and lift it up in one piece. Use your hands to break it into bite-sized pieces. Store the candy in an airtight container at room temperature for up to 2 weeks.